View More In Plumbing Fittings. Sealed flotation tanks and compartments should be ventilated with drain plugs. Simply loosen the plugs whenever you store the boat to equalize air pressure in the tanks and to prevent moisture from condensing out of the trapped air. These 1" drain plugs are very quick to install with one drilled hole. Drive in the screws (sold separately) with a dab of silicone beneath the flange to seal the plug. Drain plugs are used to ventilate sealed compartments in the Annapolis Wherry, Chester Yawl, Eastport Pram, Skerry, Jimmy Skiff, Northeaster Dory, Passagemaker Dinghy, Oxford Shell, and Mill Creek kayaks, among other CLC designs. 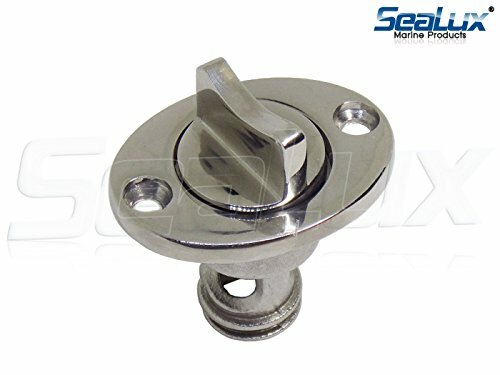 Description: - Heavy duty marine grade cast solid stainless steel, corrosion resistance, tough, strong and durable - Screw type drain plug with an O-ring for positive sealing - Retention system prevents plug from getting lost when removed - Mounts in a 1" diameter hole - High polished head side for mirror-like appearance and to match modern watercraft/boat/yacht - Great for boat transoms, fish wells, ice chests and more Specification: - Material: Stainless steel - Color: Silver - Hole Outer Diameter: Approx. 2.5 cm/1 inch - Flange Size (L x W): Approx. 5.1 x 3.7 cm/2 x 1.46 inch - Screw Hole Diameter: Approx. 0.5 cm/0.2 inch Package Includes: 1 Piece Boat Drain Plug Note: Please allow slightly difference due to manual measurement. Color may be slightly different since different monitor. Turn and lift plug; plug is captive to the base, so you will never misplace your boat's plug again. Provides bilge drainage upon haul out. Captive garboard drain plug is investment cast in 316 Marine Grade Stainless Steel using the highest industry standards.Highly Polished Cast 316 Stainless Steel construction for perfect for harsh environment and prevent corrosion resistance. If you have any questions about this product by SeaLux Marine Products, contact us by completing and submitting the form below. If you are looking for a specif part number, please include it with your message. © 2019 - breezinthrucharters.com. All Rights Reserved.